For those of you wanting to eat healthy and are worried about pesticides, herbicides, hormones, antibiotics, etc. in your food, frugality in your grocery shopping may seem like something of an oxymoron. For our family, we have chosen to sacrifice in other areas rather than sacrifice in the quality of the food that we eat. For this reason, I'm always thrilled when I can find a very healthy, inexpensive meal that my children love. What a versatile grain! It can be used as a side dish or main staple, just as rice can. In fact, you can be just as creative with millet as you can with rice. But for our family, millet is a staple for breakfast. It was the first cereal for my oldest two, Reader Rabbit (RR) and Energizer Bunny (EB). Since Goofy Boy (GB) has had some unusual health issues, I just started him on it this week. He's 15 months old. Thankfully, he loves it too! If you can do cream of wheat or oatmeal, you can easily do cream of millet. And it's extremely yummy to boot! My mother-in-law visited my sister when she was quite ill about a year ago. (They lived in the same town.) She made a pot of this for her to help nurse her back to health and my sister loved it! She now makes it often for her own family. Sometimes she even gets a craving for it! I have the privilege of having a grain grinder, so I can crack my millet to give it a little more texture. But if you have a blender, you can grind it to a flour or even slightly less for a more textured cereal. You may want to experiment with the water to grain ratio. I have my own little formula that I will share, but that's simply because it's the consistency that I like. If I'm grinding only 1 c. of whole millet, it makes about 1 1/4 c. cracked millet. That cracked millet will simmer with 5 c. water. Sometimes though, I'll cracked lots and lots of millet at one time. Then I will cook 1 c. cracked millet with 3 1/2 c. water. Now that GB is eating this, I'm going to have to figure it out for 1 1/2 c. cracked millet. It's really not an easy math problem, in my opinion. I've tried simply doubling the amount of water or cutting it in half from what I know works, but it doesn't work for me. So, I'll go back to experimenting. The good thing is that it's edible no matter what! So, how's it done? I thought you'd never ask. 3. Stir frequently (very important!) until it begins to bubble. 4. When it begins to bubble, it will look grainy. This is good! Take it off the heat and cover. Wait 5-10 minutes and your breakfast is ready. Our family likes it in a variety of different ways. I'll mention some of them to start your creative juices flowing! --for my little babies, I've often used millet as a base for their mashed veggies. Sounds gross, I know, but babies have no idea! 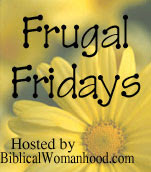 Enjoy and return next week for more Frugal Fridays hosted by biblicalwomanhood.com! Do you know is millet gluten free? I just might have to try that one. I can't wait to get a grain grinder (someday I hope) so I can try this. Thank you for the tip about millet for babies a while ago, by the way. I found some organic baby cereal that is a mix of millet and rice, and Jack is doing pretty well with it. I had never heard of anyone ever eating millet until a missionary from Niger came to our church a year or so ago and said that was basically all that their diet consisted of where they were. Of course, we felt sorry for the him because all they ever ate was considered birdseed here! However, he and and his family were all very slim and healthy, so I think I'll have to check into where I can get some milllet around here! Great Post....as steel cut oat eaters...we could use a diversion and this wone is a nice one. thanks...and great post on eating healthy and organic!!!!! yeah! Esther, by the way, I love your name! Yes, millet is gluten-free. Wonderful grain it is! Catherine, as mentioned in the post, a blender works just as well. My sister is making millet for her second child now and she only has a blender. Tammy, I laughed SO hard when I read your post! I wonder if people feel sorry for my children when they discover that I feed them millet?